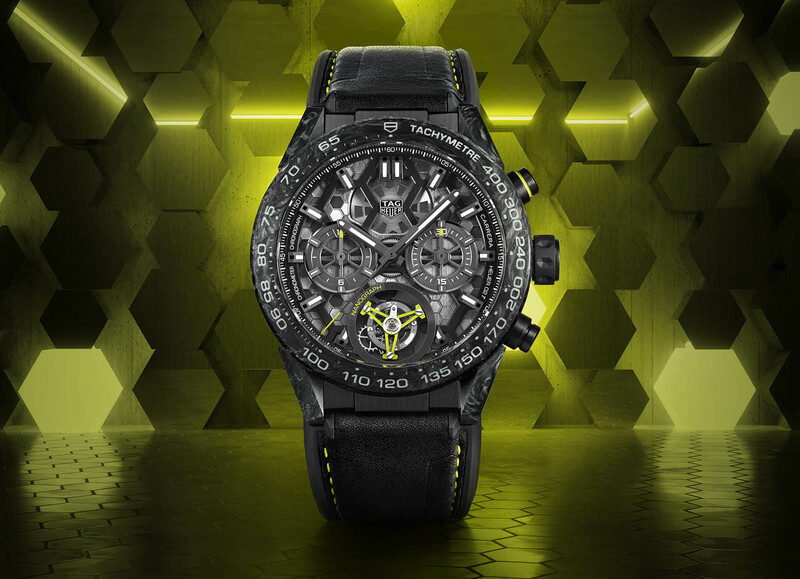 After Zenith’s introduction of the Defy 21 equipped with a hairspring made of “carbon-matrix carbon nanotube composite”, its sister company TAG Heuer has also unveiled a proprietary carbon composite hairspring at the heart of the new Carrera Calibre Heuer 02T Tourbillon. The watch is likely just a trial run for the material, which boasts properties that make it appealing for other movement components, especially those in high-frequency, fraction of a second chronographs that are a specialty of TAG Heuer (and also Zenith). The new hairspring was produced at TAG Heuer’s own laboratory in La Chaux-de-Fonds. Much like silicon, the favoured hairspring material of the 21stcentury, carbon composite is a lightweight, low-density material that’s non-magnetic, and shock-resistant. And like silicon, carbon composite can be produced with high precision, resulting in a geometry that offers perfectly concentric oscillation. That also reduces the need for further assembly, as the collet axis attachment is integrated into the balance spring itself. But what sets crystalline carbon apart is its robustness, which means it has most of the qualities of silicon while doing away with its brittleness, a weakness that explains why silicon is still shunned by some quarters of the watch industry. The Carrera Calibre Heuer 02T Tourbillon Nanograph features the same 45mm case with a modular construction that’s used across the Carrera line. 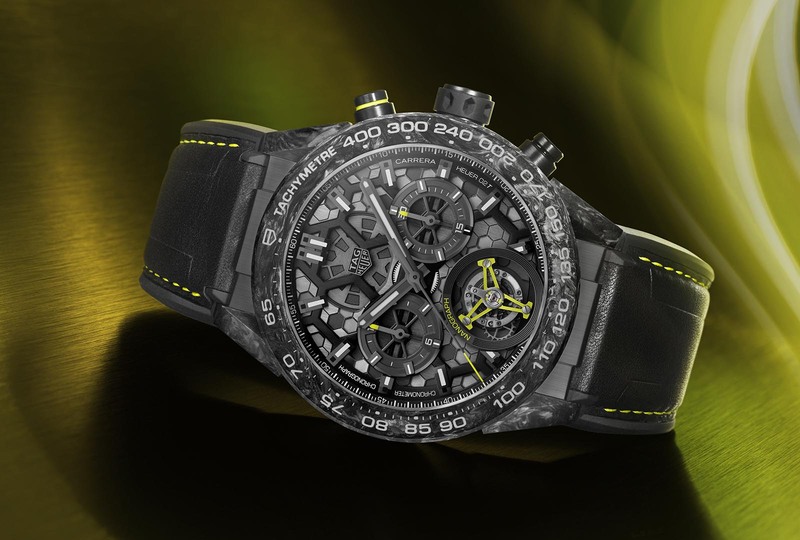 It is made from black-coated titanium with a carbon composite tachymeter bezel. 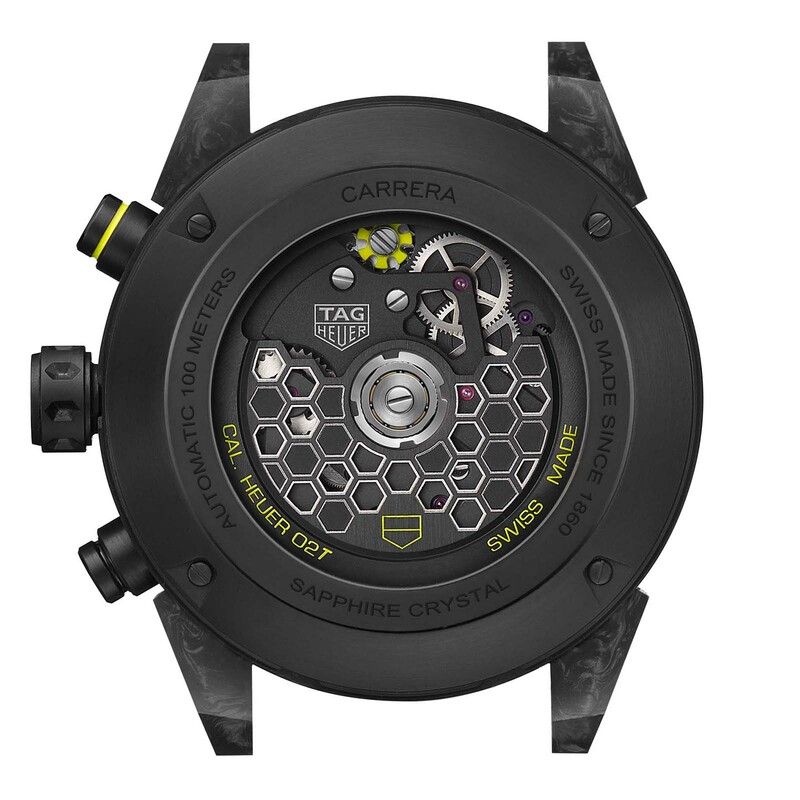 The black semi-skeletonised dial reveals a movement plate that has been decorated with a hexagon motif, a reference to the nanoscopic hexagonal structure of carbon. 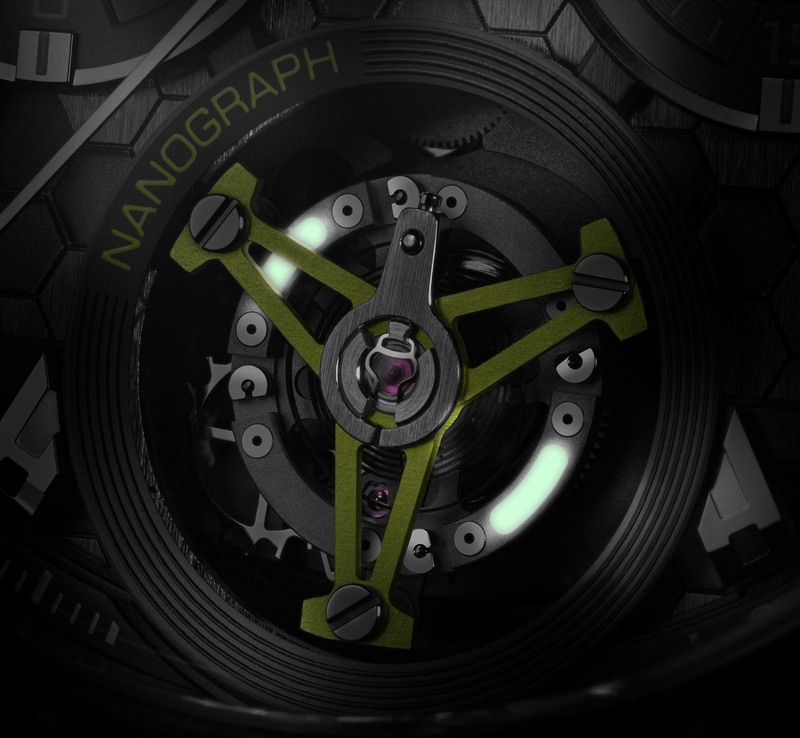 Typical of a racing inspired watch, the Nanograph is mostly clad in black with several yellow accents, including the aluminum cage of the tourbillon. Notably, the aluminum balance wheel features Super-Luminova markings that highlight its novelty. Apart from the carbon composite hairspring, the flying tourbillon movement inside remains identical to that in other Carrera Heuer 02T models. It’s an in-house, COSC-certified calibre that is based on the CH-80 chronograph movement, and self-winding with a 65-hour power reserve. Visible through the sapphire case back, the movement also features a yellow-painted column wheel while its winding rotor repeats the hexagon motif of the dial. 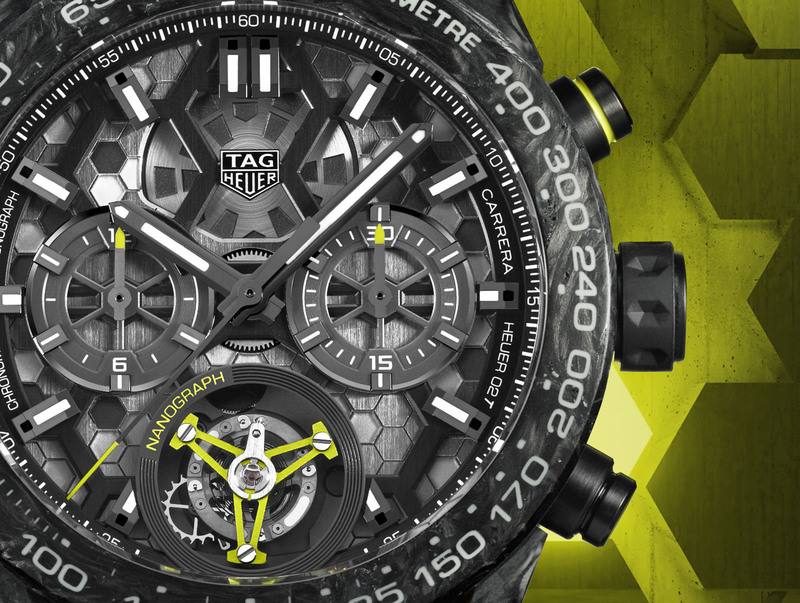 The TAG Heuer Carrera Calibre Heuer 02T Tourbillon Nanograph (ref. CAR5A8K.FT6172) is priced at US$25,500. Powered by a new movement with twin balance wheels and mainsprings.